I didn’t discover eggplant (aubergine) until I lived in Italy. I don’t remember it being a vegetable that I was aware of when I was growing up in suburban Sydney. Perhaps it wasn’t as widely available as it is these days. Nevertheless there are several dishes featuring melanzane that I really rather like. This recipe was created by a friend of my husband. slice the aubergine lengthways, discard the outer slices and fry the remaining slices in olive oil with salt, pepper and a sprinkling of fennel flowers. Remove and drain. Fry the sliced cherry tomatoes for a few minutes with salt and pepper until they soften, then add the pine nuts, and some fennel powder. Meanwhile cook the ravioli, drain and add to the tomato mix and stir. 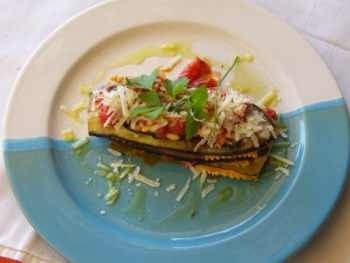 Lay an aubergine slice on each plate, arrange the ravioli on top with tomato mix. Repeat till ingredients are used, finishing with the tomato mix. Top with fresh pecorino shavings and parsley to garnish and serve.